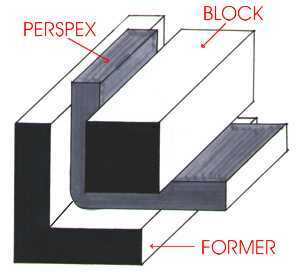 The sketch opposite is of a former and block that are used to bend perspex to 90 degrees. The perspex is heated until it becomes soft and then it is placed in the former until it cools. 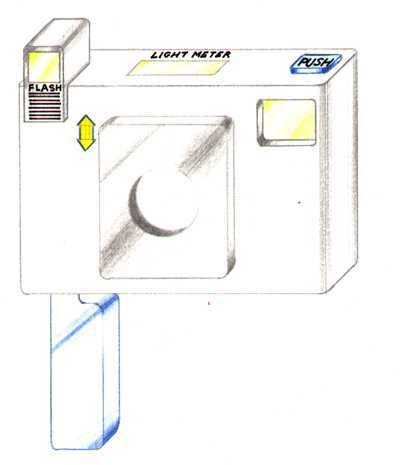 The diagram can be drawn quite quickly because the designer used a style of drawing called oblique projection. So long as basic rules are followed, oblique projection is quite easy to master and it may be a suitable style for you to use in a design project. The basic rules are outlined below. 1. Draw the front or side view of the object. 2. All measurements drawn backwards are half the original measurement. 3. 45 degrees is the angle for all lines drawn backwards. STAGE TWO: draw the back two lines of the cube in position. Go round the outline of the cube with a fine black pen or dark, sharp pencil. Complete the three shapes shown below - in oblique projection. Example of a basic design for a camera, drawn in oblique projection. Shade/colour has been added - see earlier sheets for shading and colouring techniques. Draw an item of your choice using oblique projection - for example - a personal stereo.